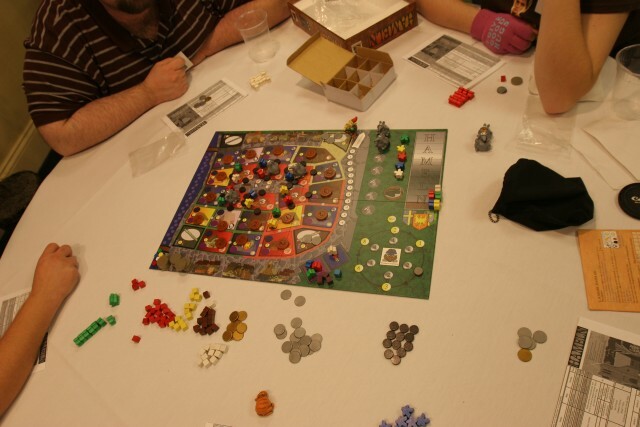 We started out with this very thematic game, Jenseits von Theben. I decided to spend most of the time collecting cards around the cities. I turned out to be pretty well rounded in specific knowledge. And I gathered 5 Kongress cards (triangle point cards). So, I started digging. I was pretty lucky on one dig: out of 4 cards, I received 4 artifacts. Marty was even more lucky than I though. 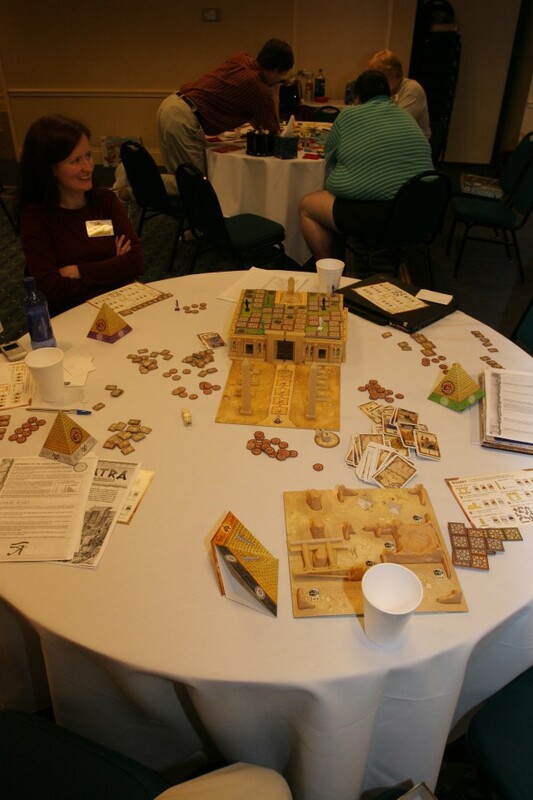 His excessive knowledge in Palestine, his breadth of artifacts dug up from there, and the two showings that he was able to attend won him the game. The cards dried up during the game. Early on, we had a number of showings (only two of which were attended). 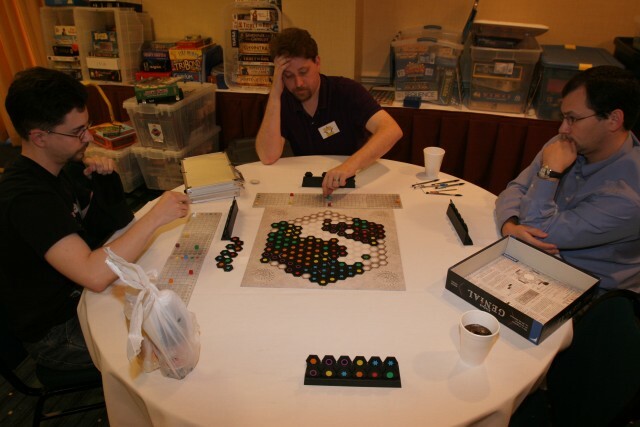 However, towards the middle of the game, no conferences showed up at all. So when the cards stopped being attractive, the only thing left to do was dig. if the number is higher, or if it is a color trump, then if the color is higher. If it was overtrumped, then you take the trick and an extra point as recorded by an extra card (so these points could run out during the course of a hand). One strategy you can use is to attack the base trump. If someone is forced to play the card that they used to show their trump card, then they loose the power of trump. Whatever cards were left which would have been trump are now normal cards. So one strategy is to try and get someone to be forced to play that card. Of course, usually people will pick trump of whatever is their longest suit or number. However, if that person picked blue and displayed the blue 5, then playing other 5’s as a number will get them to play that card. I always like trick-taking games. And there are many of them out there with unusual twists. For this game, you are forced to now keep track of 7×7 things instead of 7 things. Also, when you try and save walkers of a suit (low cards that are the only ones left), it is hard to try and stop someone else. Normally you will trump in, but if you are out of trump, then chances are that the cards that they will play will be different than cards you can cover. For example, if you hold the 6 of blue, then someone can play the 5 of blue as a number. Which means that the 6 that you hold is considered sluff. Only a 5 of red, orange, yellow, or green will beat that blue. Did you save one of those as well? I have been wanting to play this game for a while now if only for the bits. You are building Cleopatra’s palace. The different pieces are obelisks, sphinxes, walls, door frames, and Cleopatra’s throne. The box is used as part of the building, so at the end of the game, the completed structure looks impressive. Game play is easy. You either collect cards that represent resources (wood, stone, marble, lapis, artisan) or special abilities, OR build a section of the palace and collect money. When 5 of six sections of the palace has been built, the game is over. Only money counts as victory points at the end of the game. However, there is one mechanism that you have to watch out for. And that is corruption. Some of the more powerful cards, like the double resource cards or the special ability cards, are tainted. If you play them, then you get corruption tokens which are secretly placed inside of a pyramid bank. At the end of the game, you get more corruption tokens if you have cards in your hand that are tainted. The person with the most corruption automatically loses. There can be points in the game where you offer money to remove corruption tokens. However, only the person who offered the most money gets to remove three tokens. The other people get one or more tokens. Painful. And unpredictable. It can happen a lot or a little during the game. In our game, it only happened once. 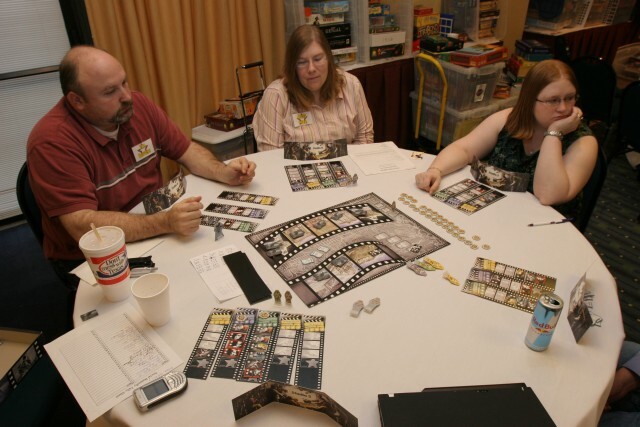 During the game, the ladies at the table (Mary “Corruption Jones” and Amy) were taking corruption tokens. I knew Amy was going to spend a lot of the money that she earned during the offering. So I went for second place. Amy ended offering 13 dollars which I thought was a lot. As the game progressed, I started taking corruption tokens. And when the game ended, the corruption tokens were surprisingly close (9, 8, 8, and 6). Mike lost and I ended up in first place based on money. If Mike would have taken one less, then only Mary would have won. Marty brought out this game claiming that it would be quick. Unfortunately, it turned out to be the complete opposite. But I was able to chat and do other stuff during the massive downtime. Since only myself and Mike were not playing games, Mike suggest that we play Carolus Magnus as a two player game. I like this older Colovini game. It doesn’t really need a them. In fact, I cannot remember what the theme is supposed to be. All you need to know is that it is a majority game. You want majority in some of the five colors. Because if you are first in a color, you can use that color on the board to cast votes for you. And if you have the most votes on an island when the king comes around, then you place your marker(s) on it. If the neighboring islands are also owned by you, then you can merge them into one super island. Once you place all ten of your markers on the board, the game is over. This game was close. It came down to a dice roll at the end. Could Mike roll the colors that he needed? Yes, he did. I certainly had fun at this convention. 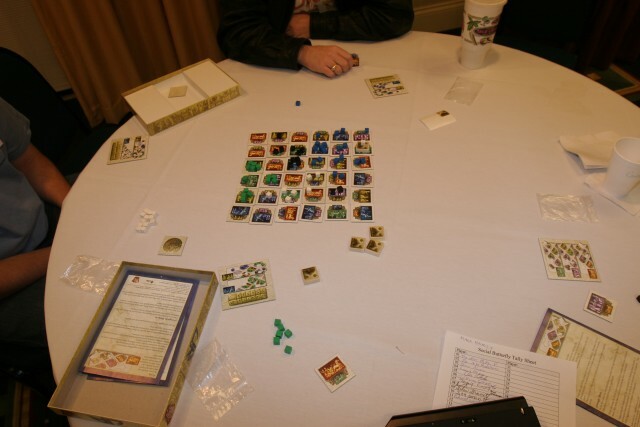 But I am sad that I didn’t get to play Train Raider, Struggle of Empires, or my many other Wallace games that I brought. Kevin was still the nicest person at the con. Amy, the Cookie Pimp, made some wonderful cookies. 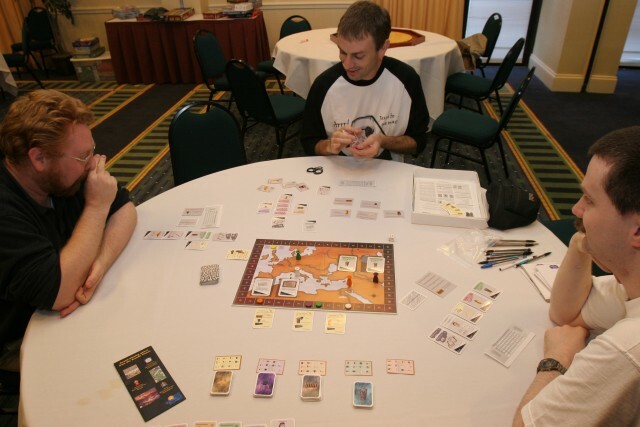 Imperial was surprisingly the most played game at the con. The hotel was actually pretty good. It had a Tempurpedic mattress, fitted sheets, and free WiFi. 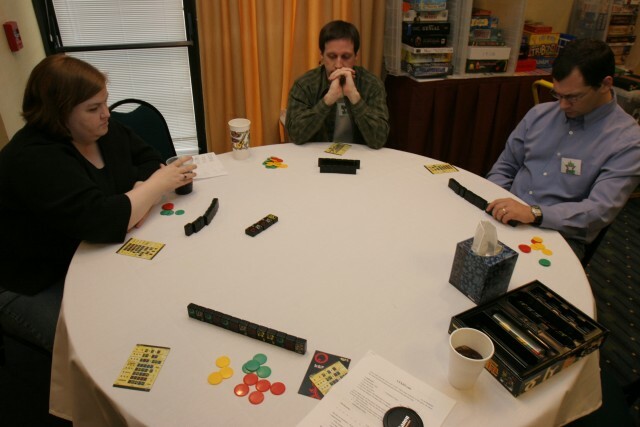 This entry was posted in Lone Star Game Fest on December 31, 2006 by Mark. We played this quick and lightly meaty game as a partnership game. Our team maxed out the orange color first. So I turned to other colors. Unfortunately, red was our Achilles heel and it proved to be our downfall. This is a new game that I wanted to try. 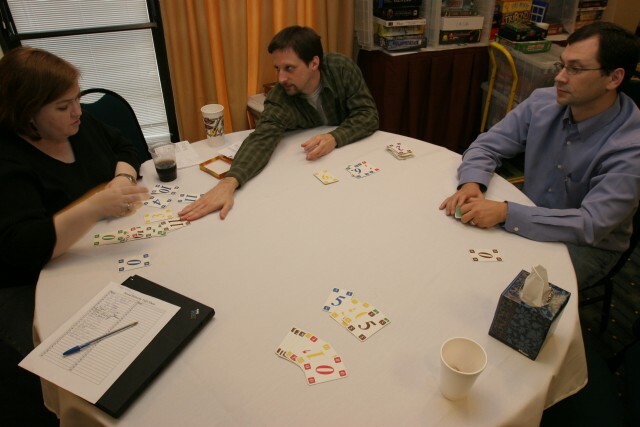 It is a bidding game that uses four currencies for five auctions. You bid on chips that give you actions in three categories: money, victory points, and drawing cards. Also, there are two structures that you must build that will let you score more victory points. If you don’t build the church, then you cannot score past 25 and if you don’t build the cathedral, then you cannot score past 45. So it is imperative that you keep some money to build those structures when you need them. I like the tiles in this game. They have a great build quality to them. And I like the Tichu-ness of the game play. We played only five rounds (for the number of players). I think that this was too little as it doesn’t offset the luck of the draw. But still, its an alright game. Next up was Sticheln. With four players, I think it starts pushing into unpredictable territory. It is at its best with three players. And I like the feeling of impending doom that this game gives you. On my hand, I had some poor choices. So I went for the blue suit (10, 8, 5, 3 – I think). I was a bad sign when someone else chose blue as well. Luckily for me, I was able to duck under the tricks on my 10 and 8 card! Phew! WTF? 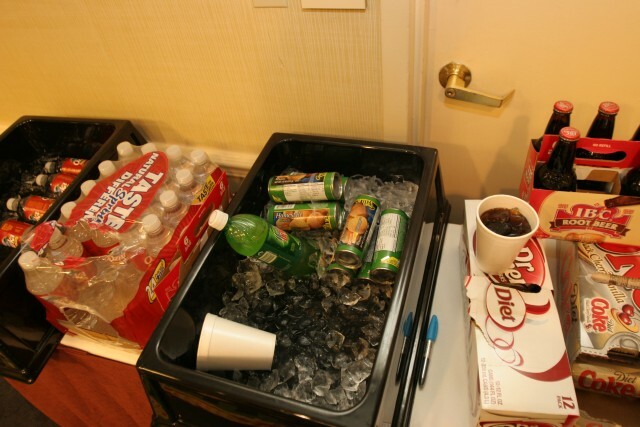 Is someone drinking biscuits at this convention? 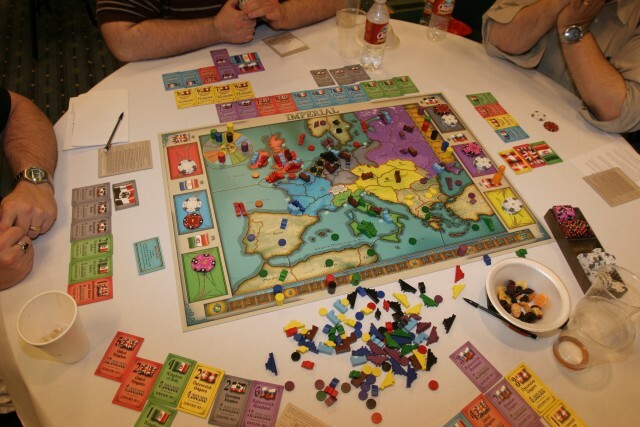 I like this old Knizia game. Part of its charm is the “what if” scenarios that you imagine when you pair up famous actors in old movies. The new re-release is just ugly. They use fake but recognizable parody names. Gah! Anyways, I was surprised that my 19 green movie was able to hold up for the whole game. It got me best picture for two years and best picture overall. At the end I was trying to finish any one of three yellow movies. I just needed one chip each. But it was not to be. Still, I finished in first though. Since I have been playing 42 at lunch lately, I had to play this tournament. My partner, Brandon, was new to 42 and I tried to teach him all that I knew in the time before it started. He did well though. What was different was the utter lack of variants that we used during the tournament. The two were that you could call doubles as their own suit and that you could call nillo at anytime. You couldn’t lead the low side of a bone or splash or plunge. I think that the nillo at anytime is just too powerful though. In the first game, I came across an interesting ethical dilemma. 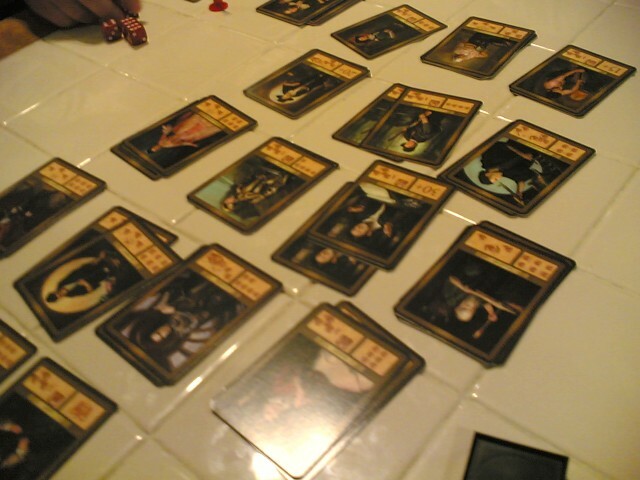 Due to the table, I had difficulty shuffling the bones. Sometime, one would flip over. So when someone told me that they had noticed that the 6:5 flipped up and then tracked it during the shuffle, I was not happy. They declared that they were going to take advantage of people messing up. When it happened again, that person would stare like a hawk during the shuffle. Of course, trying to speed up the shuffle was not helping matters. Afterwards, Marty told me a good way to combat that by taking the tile and one other and putting them behind your back. You then swap them or not and replace them on the board. Oftentimes, I might be able to see someone’s cards during a game. I either don’t look at them or if it is just too obvious, then warn them. Thankfully, our game group does not have this type of person playing at it. On the second round, one of the opposing teammates called nillo a lot. Like three times. And was set each time. So from my experience, the winning percentage of nillo calls during this tournament was not very good (like 25% or so). On the third and final round, our score went from 0/3 to 3/4 to 3/6. I never had a hand worth bidding. How sad… Still, it was a blast! 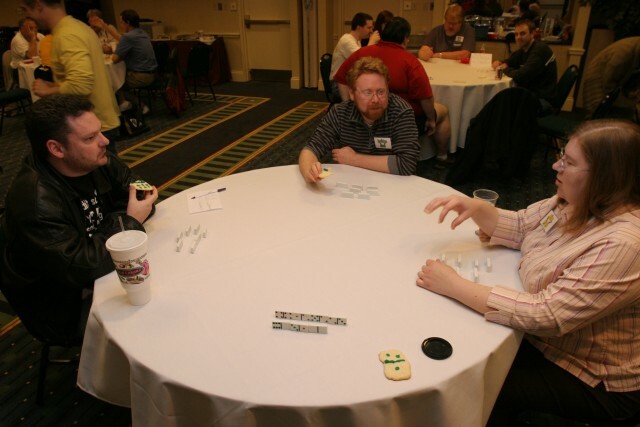 This entry was posted in Lone Star Game Fest on December 30, 2006 by Mark. Another year has passed, which brings me to the start of the Lone Star Game Fest. I bypassed the usual Thursday gaming in order to pack and go to bed early. 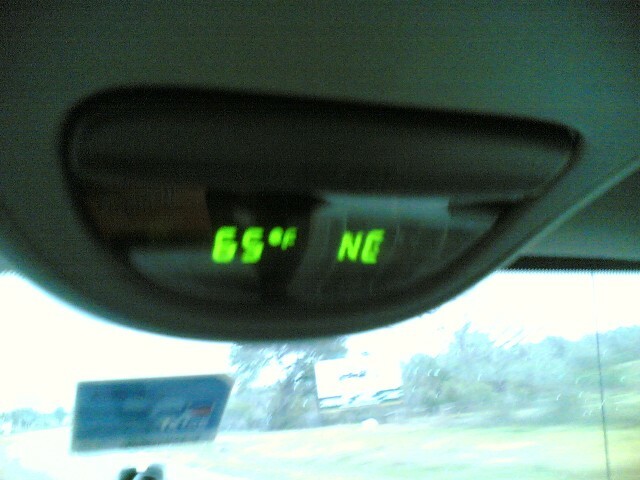 I left at around 6:15 am and drove east on 79. Google maps had me take FM-1660 south when I got to Hutto. But, when I saw the new SR-130 toll road, I was not about to try and find an unfamiliar road in the dark. Besides, the toll road was still at its introductory free price. It linked up to US-290 which I then took down to Houston. US-290 is interesting because it is a road where you can drive 70. Yet it passes through all these towns. A couple are no stop light towns. They slow you down to 55. At one point I looked up and noticed that I was going north-east. WTF? I thought Houston was south-east of Austin. It was around Burton, TX. A road hiccup, I guess. I made it in at around 9:15. The drive through Houston was a blight of interstates and big box sprawl. I wonder if there are any houses in Houston because I sure didn’t see any. I had one tense moment when I was in the left lane and realized that I had to be in the right lane immediately to make it to another interstate highway. I just put on my blinker and forced my way over. I think that the frontage roads here train people to just accept that behavior. After all, you are transferring from a three lane, 65 mile per hour road to a three lane, 45 mile per hour road and then making a right turn into a business. When I got to Mosley road, I pulled into the first Marriott hotel. Which was a mistake. It seems that there are three Marriott hotels that are besides each other. And mine was the third. Go figure. After I dropped my luggage in the room, I went down to scope out the scene. 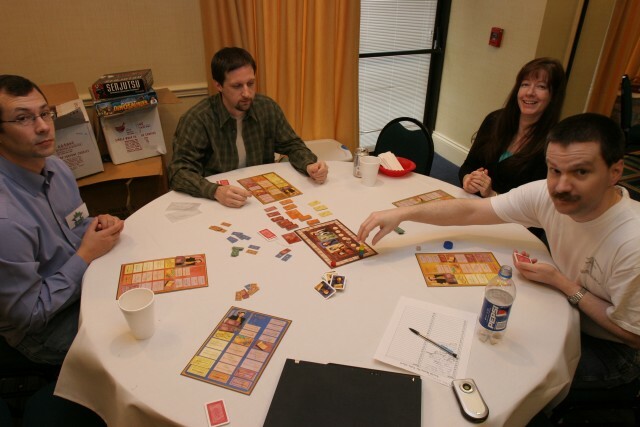 There was already a table of gamers playing. 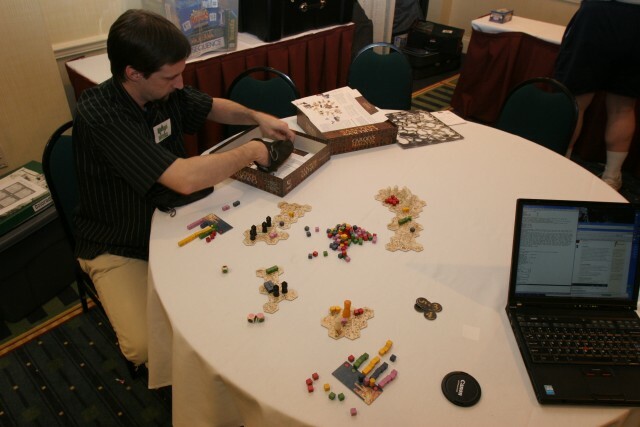 Kevin was there setting up and he started a game called Desert Bazaar. Which was designed by another gamer, Brian Yu. The rules are simple. But with analyzing gamers it takes a little longer than it should. Collect materials: Take a card from one of the four supply decks. Roll three dice. The dice have on them the four colors, one blank desert, and one wild color. You can pick one of the four colors and get the number of cards that was rolled on the dice. Optionally, you may set aside one die and re-roll the other two. However, if the color that you picked did not show up on the re-roll, you loose any chance of getting cards. not score until it reaches 7 in size or only at the end of the game. I tried out a new strategy by choosing spice as the third player. Sadly, it didn’t work all that well. Also, people kept doing different things than I thought they would. Unfortunately, players cheated during the game. Player A operates a shipping company and expands it by placing a new ship, I ship rubber to cities, then player C tried to operate a rubber company but they notice that they cannot ship rubber because the city has been occupied already by me. So then player A undoes the ship placement and places it to help player C be able to ship that rubber. Both players have played the game before so that wasn’t an excuse. Sigh. I just had to try this game out. The company, Fragor Games, made a splash with their second game because it had such nice figures. This game continues that tradition by adding more nice figures. The game play didn’t wow me. And the pieces don’t justify its expensive price. But I had to at least try it once. 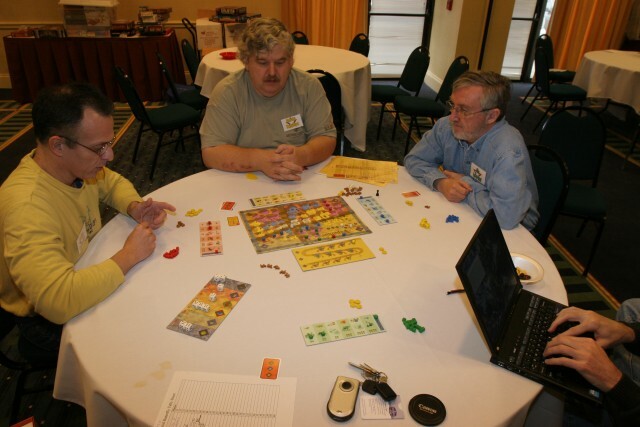 agriculture – put two tokens on every green tile that has your tokens. Keep your tokens on adjacent tiles and remove tokens on all non-adjacent tiles. 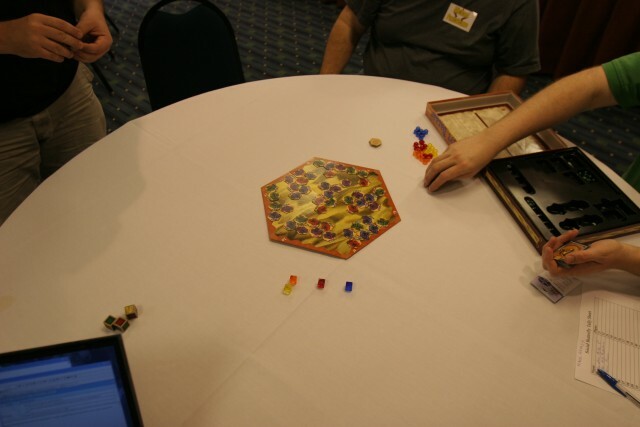 commerce – put tokens on every purple tile. The number of tokens that you can place is one for adjacent orthogonal enemy owned tiles and one for non-existent adjacent orthogonal spots. culture – put one token on adjacent orthogonal tiles that are occupied by you. politics – redistribute your tokens where ever you want. There is a limit of five tokens per tile. war – attack another tile. Losses are the number of enemy tokens and one extra if the tile is a different color than where you attacked from. You then move tokens into the attacked spot. You have one tile in your hand that determines your two actions. You can skip an action to add one token to an already existing controlled tile. Or you can skip both actions to put one token on an empty token. After performing your actions, you then pick an empty tile that is different than the one you hold and then replace that tile for the one in your hand. 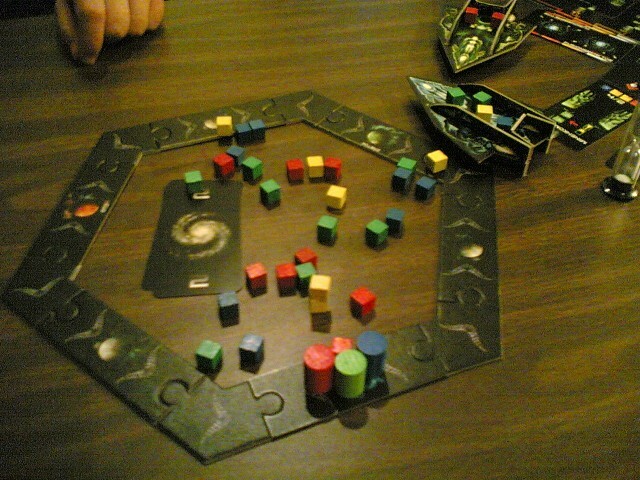 At the end of the game, you score triangle points for different colored tiles that you control. I started out with Italy again. But this time France did not hose me over by going into to Mediterranean Sea. Consequently, I was able to build Italy up quite well. I also had shares in England (from the start) and Germany. But the people who took those countries over didn’t increase their multipliers. The person who was controlling Russia realized that they could force another Taxation to end the game. Sigh. I tried warning them. But I still scored second place. 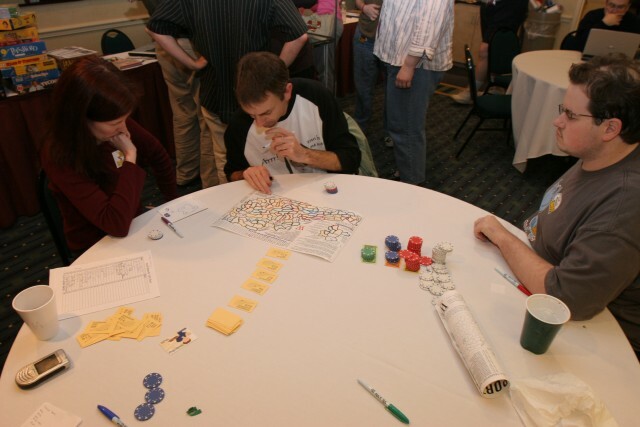 This entry was posted in Lone Star Game Fest on December 29, 2006 by Mark. This entry was posted in Web links on December 28, 2006 by Links. Today I made a loaf of sourdough bead with the leftovers from feeding the culture. You get a awful lot of spent batter when you feed a culture for a number of cycles. Usually, these go down the drain. But I pored off a cup of the active culture and used it in a rather simple recipe to make bread. I used the wet kneading process where you 1) only add 75% of the flour and the other ingredients 2) autolyze for 20 minutes 3) knead for 6 minutes 4) add the rest of the flour while still kneading. It proofed for 5 hours. And it didn’t rise all that much (maybe doubled in size). This entry was posted in Cooking on December 24, 2006 by Mark. During the now weekly feeding ritual, my forgetful mistake became a fortuitous surprise. 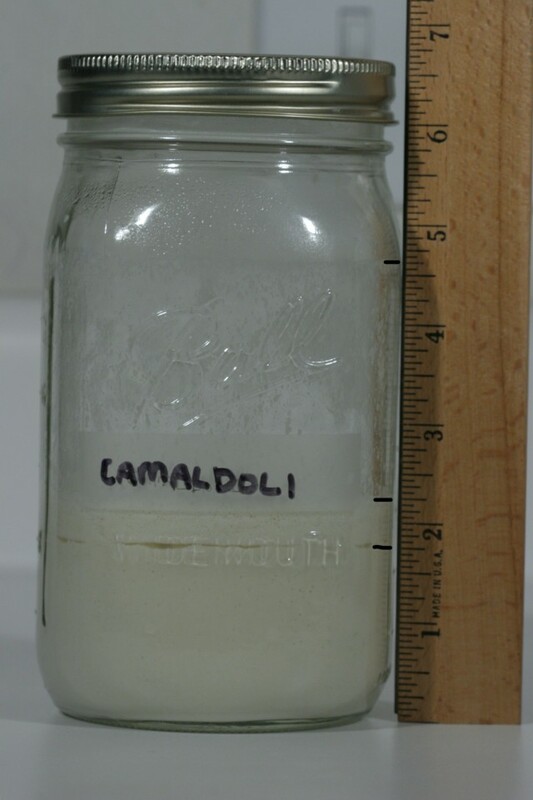 I use a wide-mouth quart-sized canning jar to hold my Camaldoli sourdough culture. Usually, I pour out enough culture to leave 1 cup left in the jar. I then add a cup of flour and 3/4 cup of water, stir it up, and put it back into the warm oven. Today, I made some bread. So I didn’t pour anything out before adding flour and water. I took a cup of the culture for my bread but still had a lot left. Mistakenly, I poured out the refreshed mixture down to one cup. Sigh. Oh well, I thought, I’ll just let the culture do its thing with less than normal. Two cups is overkill anyways. I check back and was surprised to find out that the culture had more than doubled in volume! It went from 1 11/16″ to 4 1/2″ for a 2.769 times increase. The lowest line is the starting level. You can see the beginnings of a hooch forming. The second line is the level of the foam. And the top line was the maximum height that was reached. If I would have left it at its normal level, it would have surely overflowed all over the oven again. After disc golf, we showed up at Tim’s house. He was cooking chili which smelled really good. Unfortunately, I think I experienced a shock to my system when I was outside at disc golf. The Juniper trees were visibly pollinating and our discs knocked some off that pollen down. So when I was at Tim’s house, my eyes were watering badly. At first I blamed the onions. But it was probably the cedar pollen. And maybe some cat dander as well. Who knows… but I was miserable. We started off with a light game. One that I wanted to try out. It is like Easy Come, Easy Go where you are rolling dice to achieve a goal. However in this game, there are many intermediate goals. These goals give you special abilities which you can “tap” during your turn. Some cards give you extra dice while others let you modify the dice that you do roll. Your goal is to roll seven of a kind. This gets you the King and Queen card and puts the game into a final round. Everyone now tries to better your roll. If you rolled send 3s, then they need to roll seven of a higher number or eight (or more) of any number. When it comes back to you, you get one last try to beat whoever had the best roll. And thats it. It seems like a light and quick game. This entry was posted in Gaming on December 23, 2006 by Mark. At Cat Hollow this morning, it is a cold and windy day. I almost regret wearing short sleeves. But it warms up as the day progresses. And it didn’t rain! It seems that the MUD is going to replace basket #13! Yea! Throwing at a bucket is just not the same experience. I wonder why they call it a “catcher.” Thats a term I didn’t know about. Ugh, I wonder if this is some more vandalism? But when you look at the amount of concrete that they are holding the sign post up with, I am not surprised that the thing eventually fell down. There were more discs in trees today. 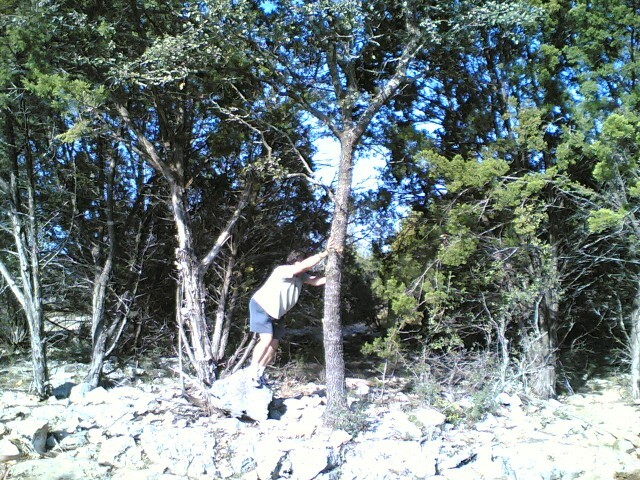 Here, Adam tries to rip a tree out to get a disc down. Not really. He was trying to shake it instead. But the tree proved tougher than him. Jon’s group’s best shot here was inside a Juniper tree. Now that’s dedication. And Rehana was able to throw it out successfully. 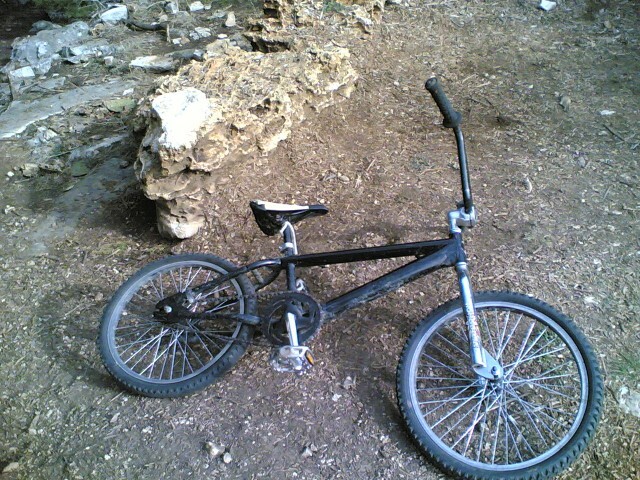 Hrm, someone abandoned a bike on the green. I wonder what happened to them? It looks like the sign was lying to us. Basket 13 was already up! It looks like they tacked the pieces of the basket together with a wielder as a security precaution. But I didn’t see a sign of concrete at the bottom of the pole. 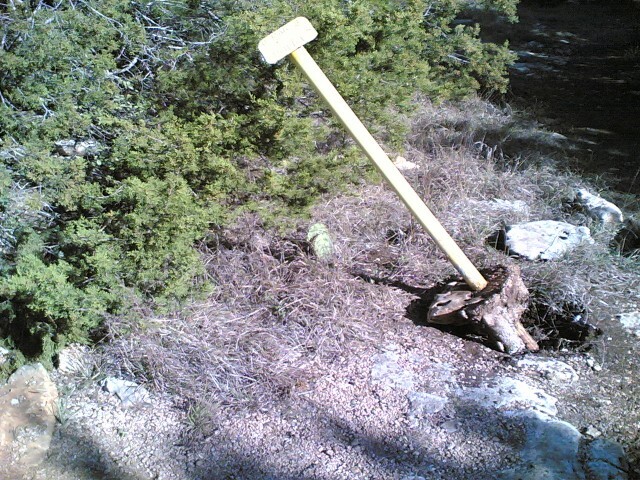 I hope that they just didn’t stick the thing into the ground like they did the last time. Adam threw close enough to the basket for us to birdie it! To end out the round, it looks like the team cannot putt at all. Two missed attempts. Fortunately Gravitt can putt. 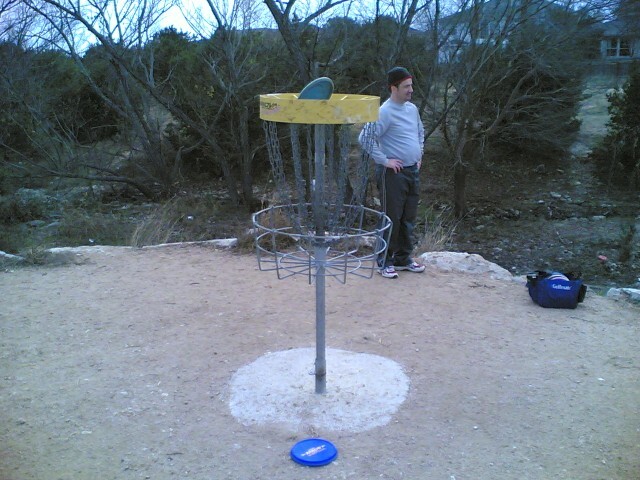 This entry was posted in Disc Golf on December 23, 2006 by Mark. Old Settler’s was beautiful out. Nice and warm (for December) out. Today, I had problems with water. 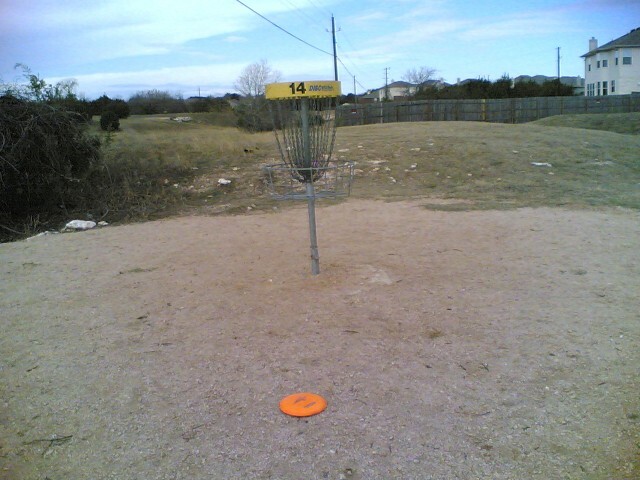 On hole 3, my disc went into the tiny stream and it was easily recoverable. Then, on the next hole, I had a dilemma. There was a father with a kid next to the lake. 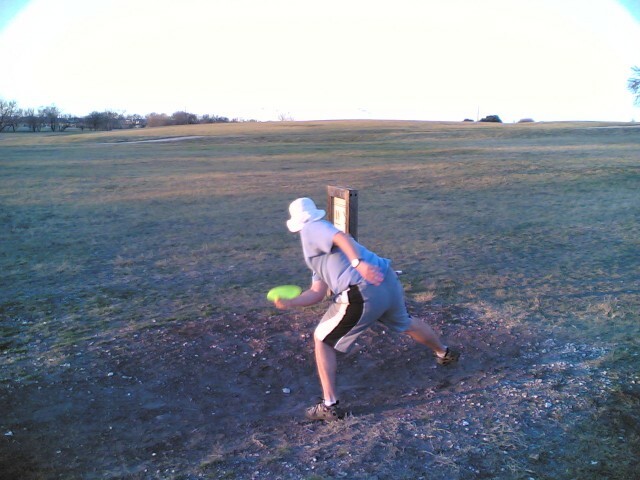 And my disc lands close to the stream so that they are between me and the basket. 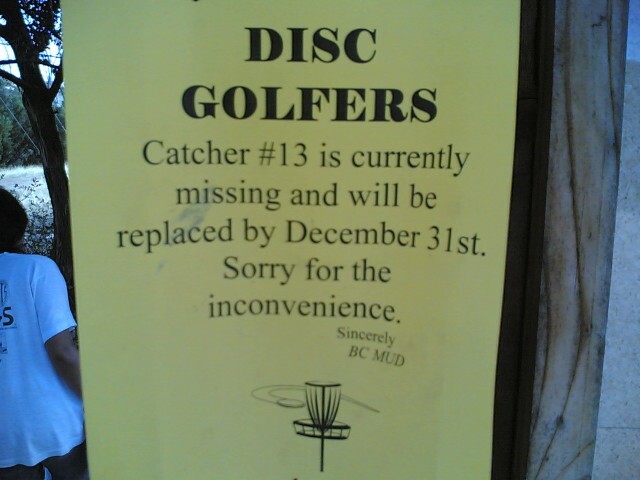 I realize that they are not going to move (and are probably oblivious that they are on a disc golf course). So I carefully throw it. I mean they shouldn’t be in the path of the disc, and I wasn’t trying to hit them, but the mere fact that they are out there cause me to mess up the throw. I yell “four” as it heads near them and lands in the water. Sigh. Fortunately I was a able to barely see my disc and successfully use John’s retriever to catch the disc and drag it to the shore. 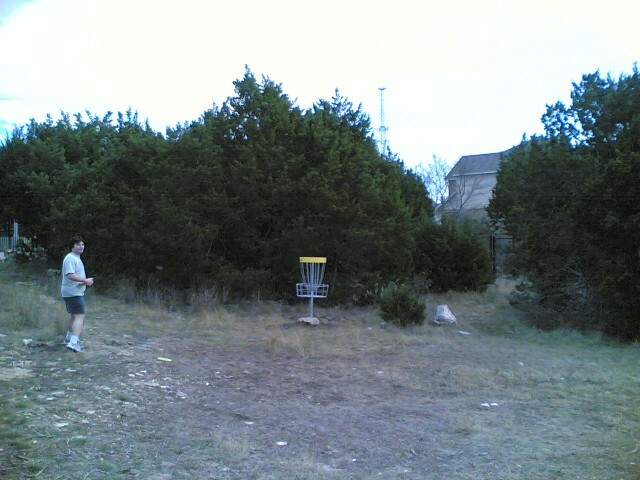 This entry was posted in Disc Golf on December 22, 2006 by Mark. Yeah, someone in our game group bought Imperial. 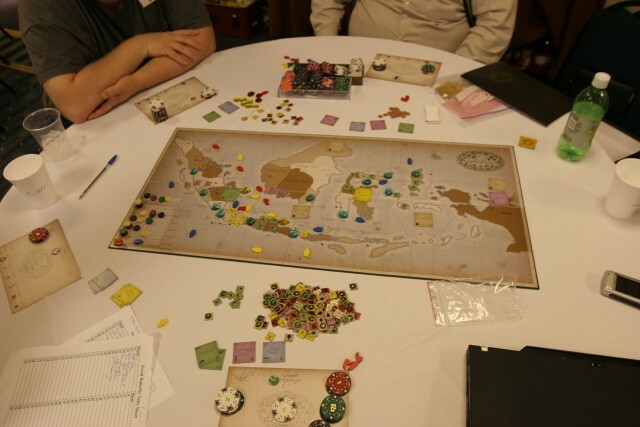 My copy is somewhere over the Atlantic ocean… In this game, I started out as Russia. I was a little worried at first since it seemed like a hard country to start. But I made a good jump with it. 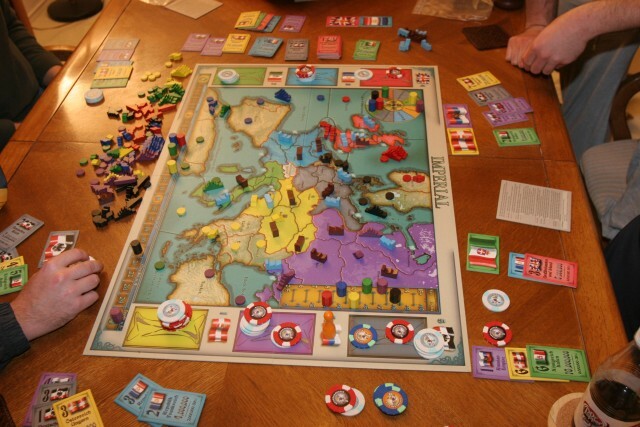 My secondary stock was in France and my next purchase was to take over controlling interest in France. Which was a mistake. This is definitely a return on investment game where your initial investment needs to pay you money. Which you then use to buy more stocks which pay you even more money. If your investments don’t pay you money, you are definitely hurting to win. Also, you should only invest in countries that will have high multipliers at the end of the game. 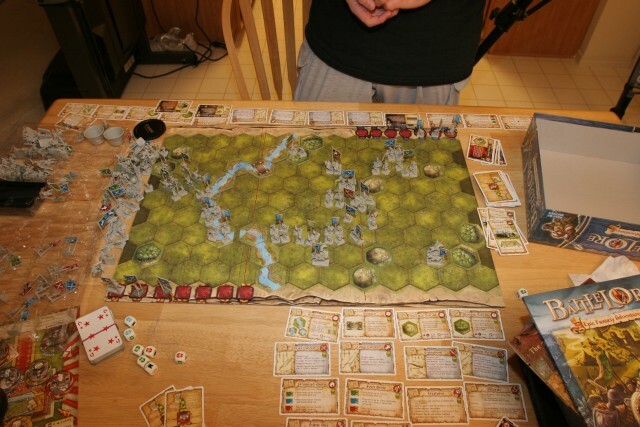 This time Adam joined me in Battlelore. He too was new to the game but he picked it up quickly. We started out with a slightly more complex scenario with Goblins in it. Still no lore yet. I thought that my side was the better off because I had one more card in my hand and Goblins can flee twice as much. But Adam definitely had the terrain to his advantage. He raced to the hill in the middle of the board giving a good defensive bonus. So I decided to focus on the left flank and the possibly weak Goblins. The river really hampered me. It weakened some of my troops. But what really depressed me was when I tried to use the Battlelore card. I had a poor rolling of the dice and could not activate 6 units. For the units that I did activate, none of them did any damage, let alone kill anything! Gah! This entry was posted in Gaming on December 21, 2006 by Mark.